The meeting this morning discussed the technicalities of how we define photography related vocabulary in our standards, followed by discussions of measuring sensitivity and resolution. Much of this was very technical and not work closely related to my own experience, although I contributed to the discussion on separating illumination unevenness from lens shading in the resolution measurement. Lunch was boxed lunches again, but apparently from a different caterer, as the boxes were different. I chose the vegetarian option again, which was half a salad sandwich plus a garden salad, the ubiquitous bag of potato chips (which I again avoided), and a choc chip cookie. No apple today, and the lunch felt smaller than yesterday, although the half sandwich was nice, on an interesting bread. Still a bit hungry, I decided to have one of the cherry danishes still sitting there from breakfast, and then what the heck, one of the apple strudel pastries. After lunch we discussed autofocus measurement and then had presentations about various JPEG projects from invited liaison guests. The meeting discussions done for the day, we travelled over to the Apple Park Visitor Centre, where Paul had arranged for us to get a tour of the Visitor Centre. 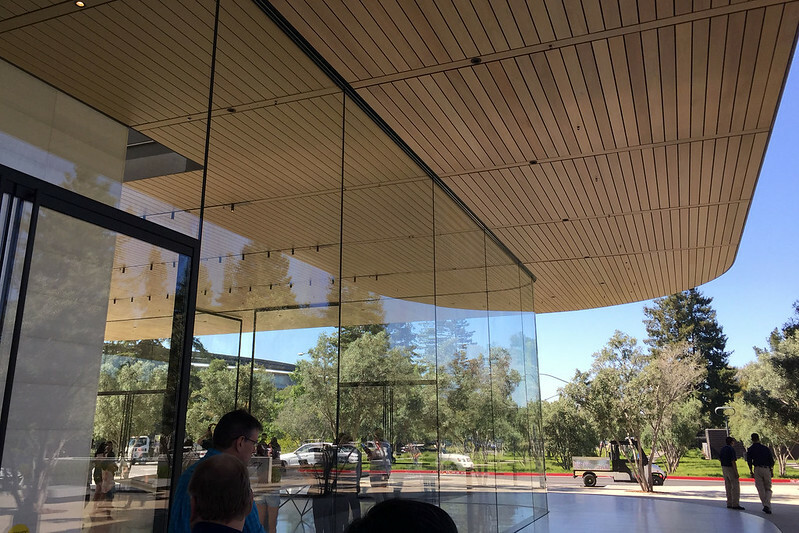 This was a building with a floor plan shaped like an iPhone, with rounded corners, all the walls made of glass, with a wooden ceiling and marble floors and staircases and interior walls. One end held a table model of Apple Park, showing only the geometry of the land and the building, overlaid with a grid pattern. 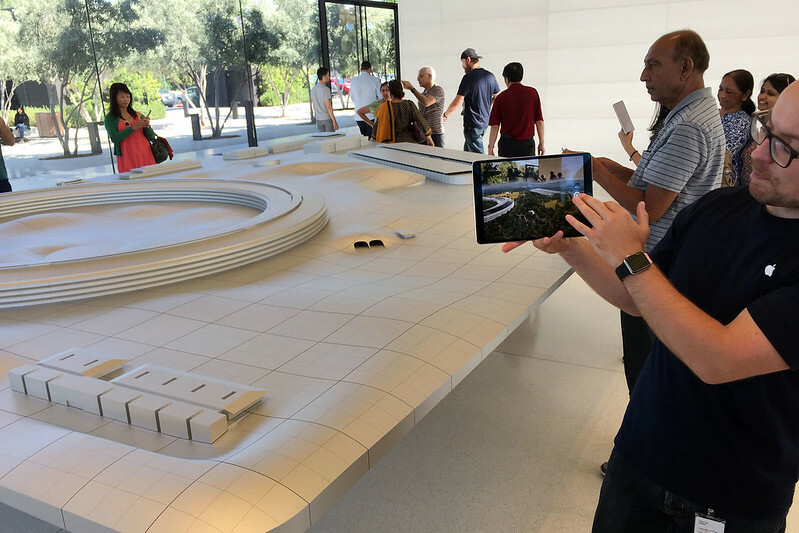 Staff were handing out iPads which people could use to view the model in augmented reality, overlaid with textures, landscaping, and interactive cutaways of the buildings. The middle section was an Apple Store with some exclusive items and a huge 8k video screen, which looked very impressive. The other end was a cafe, serving coffee and drinks and selling chocolate. Paul gave us all a $10 voucher. I didn’t want coffee, so got two small blocks of chocolate, a brand called Domori. I got an 80% cocoa dark chocolate, and a white chocolate with spearmint. I ate the dark there and saved the white for back at my hotel after dinner. 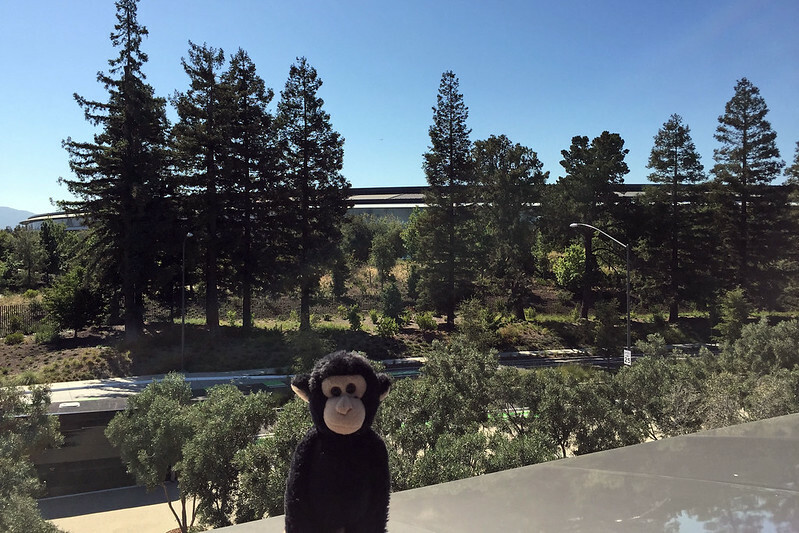 We ended the tour on the roof of the centre, looking across the road at Apple Park. Then Paul took us over there and into the security entrance where we got ID passes. 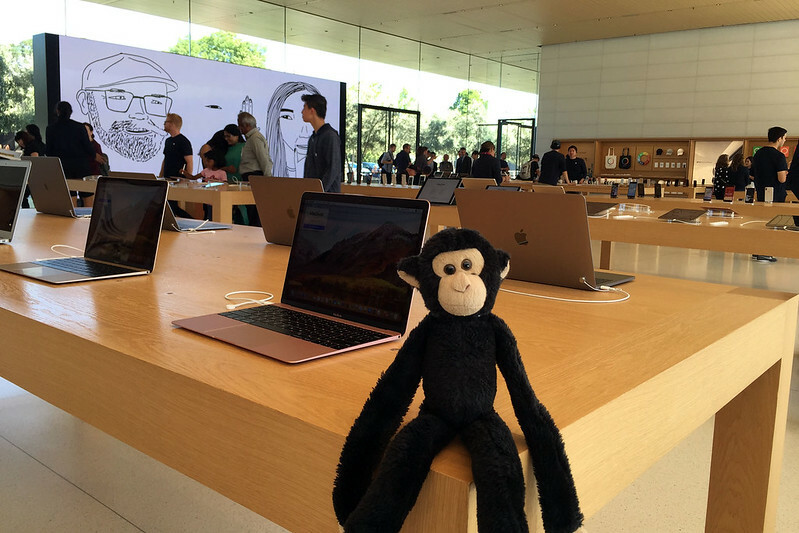 Paul informed us that photography was strictly prohibited within the Apple Park grounds. Then Paul led us into the landscaped property and over to the Steve Jobs Theatre, which is an amazing structure. It’s circular, with glass walls and a wooden roof, with nothing holding up the roof but the glass, surrounding a completely blank central floor of white marble. I was a bit stymied as to where the actual theatre part was, but realised later that the floor we could see was probably the ceiling of the theatre, with the seating and stage beneath, as there were some stairs and a glass lift that descended into the ground. We walked further across the landscaping to the main “spaceship” building, which is enormous. It’s four storeys high, with fairly high ceilings on each floor, but the height looks small compared to the circumference. We passed through the ring into the central courtyard, which is so large that you can’t see across it to the other side because of the hills and trees in there. You could actually get lost inside the central courtyard area and die of exposure overnight! We entered the ring again further along the circumference and found a bunch of meeting rooms with names on an astronomy theme: Black Hole room, Binary Star, Red Giant, etc. We entered a presentation room and sat at the rows of desks. We were there to listen to Jon McCormack as mentioned above. He talked about the four steps of photography: capture, selection, editing, and sharing, and how new technology can assist each step, leaving the photographer to concentrate on the artistic and personal expression processes rather than the technical steps. He showed examples of his photography and how he applied these principles to his work. It was a really good talk, and very inspiring. The other amazing thing was how gorgeous the presentation audiovisual equipment was. His slides were shown on a large screen which didn’t even look like a screen – it just looked like a black wall. But when he showed slides, they appeared like magic, well illuminated, in ultra high resolution. I couldn’t see any visible pixelation of the images at all. And the room was whisper quiet, with no sound of a projector or fans whatsoever. I couldn’t even work out what technology the screen was using: possibly rear projection, or maybe just a giant ultra high definition LCD screen. 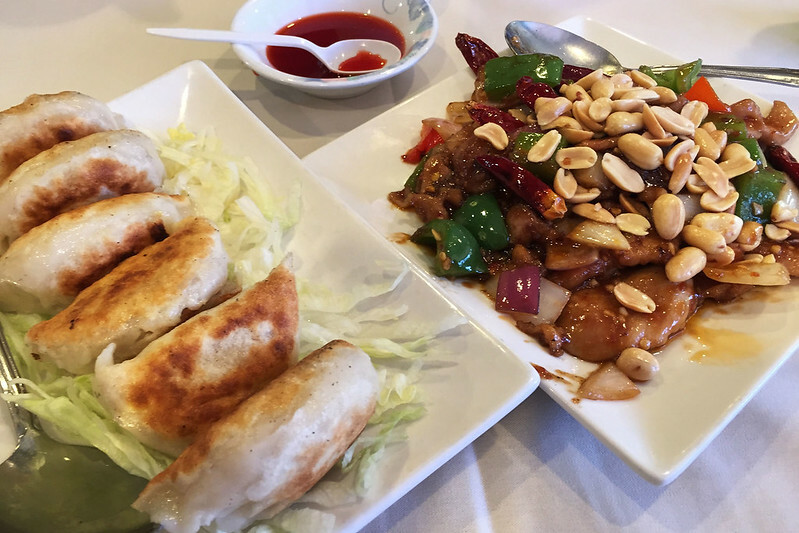 Following the talk I walked home via New Port Restaurant where I had potstickers and kung pao chicken with rice. The chicken dish was good, but arrived before the potstickers which were meant to be an appetiser, and I had to remind the waiter that I’d ordered rice as well. I found the potstickers a bit gluggy and slightly unpleasing in flavour. Overall I wouldn’t say the place was very good. After eating I walked back the rest of the way to the hotel to retire for the night. This entry was posted on Sunday, 29 July, 2018 at 13:01	and is filed under Diary. You can follow any responses to this entry through the RSS 2.0 feed. You can skip to the end and leave a response. Pinging is currently not allowed.